We love fish in this house and there are some amazing Thai dishes using fish. This is one such dish. Uncooked prawns with a blow your head off chilli dip. Finely chop one small shallot, 1 clove of garlic, finely slice 6/8 fresh chillies, add 3 tbsp fish sauce and 2 tbsp fresh lime juice. I stir in a little-chopped coriander. The plate consists of very finely chopped white cabbage, finely sliced and halved. 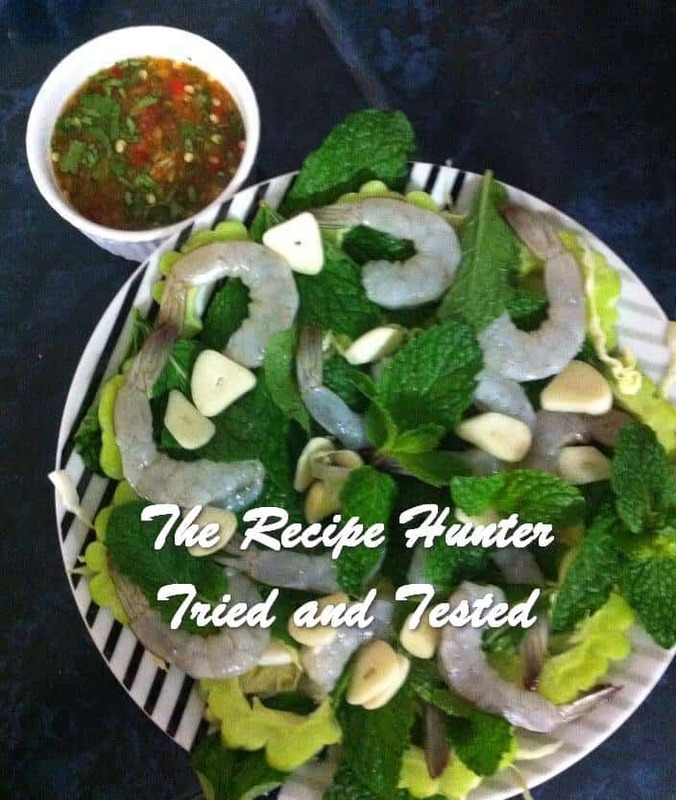 Fresh mint leaves and finely sliced garlic with some fresh lime squeezed over it and a touch of fish sauce. Eaten with steamed rice and very lightly cooked squid in a salad with tomatoes, spring onion, coriander, fish, sauce and lime juice. So that was dinner and very nice it was all fresh from the market about an hour before and that’s the great thing about living here every day there is a fresh market and I love it at my local ones I am generally the only farang there but they are getting to know me and love it when I sample the hottest of food sometimes and give it the thumbs up, and if I speak a little Thai, my vocabulary is limited at the moment the smiles all round, it really makes my day as it does theirs. ALL MY THAI RECIPES ARE AUTHENTIC TAUGHT TO ME BY MY SONS WIFE AND OTHER THAI LADIES WHO ARE GENEROUS IN SHARING THEIR KNOWLEDGE.